As injested food makes way into the duodenum from the stomach, the proteins encounter a fierce proteolytic duotrypsin and chymotrypsin which precisely cut the linear chains into short peptides which later on are acted upon by peptidases to release amino acids. As injested food makes way into the duodenum from the stomach, the proteins encounter a fierce proteolytic duotrypsin and chymotrypsin which precisely cut the linear chains into short peptides which later on are acted upon by peptidases to release amino acids. Chymotrypsin, which hydrolyses peptide bonds following bulky aromatic amino acid residues in polypeptides is actually synthesised in the pancreas and through the pancreatic duct released into the duodenum. Have you wondered why this enzyme being a powerful proteolytic enzyme does not end up cutting cellular proteins within the pancreas itself? Nature has ensured that chymotrypsin and other proteolytic enzymes are synthesised as inactive harmless precursors known as zymogens which are then activated when required only in the duodenum, their site of activity, a process called in-situ activation. This activation in molecular terms results in an alteration in its shape so that it may now be able to interact with its substrate. 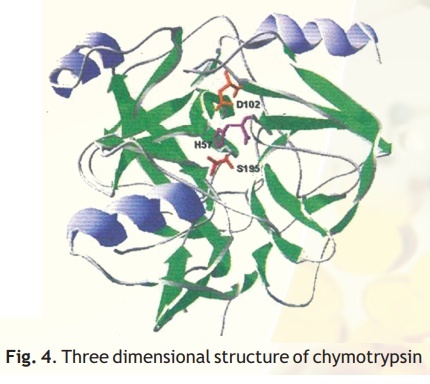 The inactive precursor enzyme is termed chymotrypsinogen and the fully active enzyme is called chymotrypsin. The enzyme chymotrypsin is made up of a linear chain of 245 amino acids interrupted into three peptides-A,B,C. The protein folds into a globular structure. In the 3-D structure of the enzyme three important amino acid residues, his57, asp102 and ser195 come close together in space (Fig. 4) which allows a "charge relay system" to operate as indicated in Fig 5. The negatively charged asp102 is able to hydrogen bond with the adjacent his57 partially borrowing the hydrogen ion from the latter. The his57 makes good its partial hydrogen ion loss to aspartate by attracting a hydrogen ion from the adjacent ser195 through the his57 residue much like a relay race where the baton is passed from one member to another, the difference here being that the baton is a charge.